The geyser gazing season is in full swing by now, so we’re happy to announce a new update for users of our iOS app that should further improve the experience while you seek out new geysers and new basins. It contains full support for comments, confirms, flags and attachments, a search interface for geysers as well as some sync improvements. Read on to learn more. 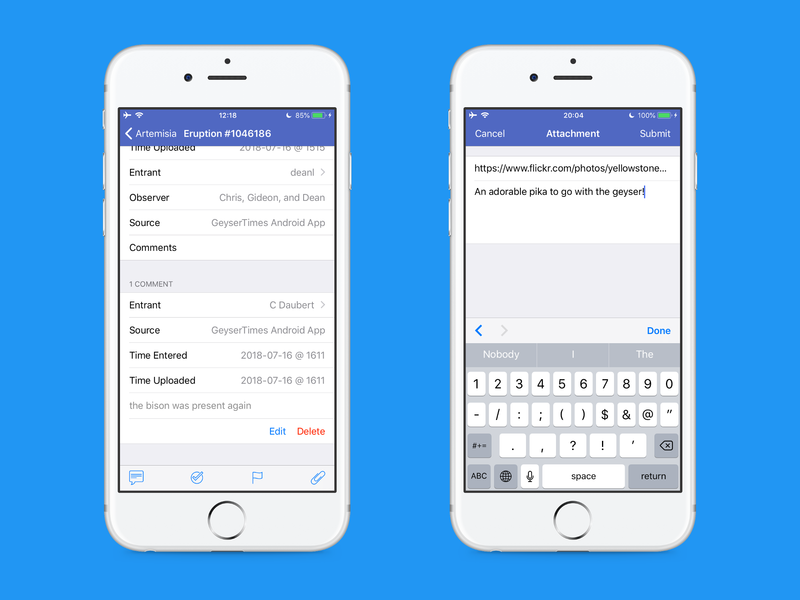 You can now submit new comments, confirms, flags and attachments directly when viewing an eruption or note. Simply tap the corresponding icon within the toolbar at the bottom of the screen and then enter the required details. For entries submitted by yourself there’s also the option to edit and delete those using the buttons presented inline within the table. Want to quickly look up information on a specific geyser? We’ve got you covered. You can now search for geysers by hitting the looking glass icon at the top right of the Day Summary and Predictions tabs and then typing the desired geyser’s name. Even more conveniently, you can use the global iOS Spotlight search which will also display the last time the geyser has been reported. The app now is a lot more proactive in making sure you have the latest data available on your local copy of the database. It will automatically perform a sync when new data is available on the server as well as periodically try to pull in new changes from the server. However, due to limitations within the iOS operating system, this will only work while the app is running (visible either directly or in the app switcher). Please keep this in mind the next time you have the urge to swipe away the GeyserTimes app. Fixed a bug which caused the app to crash when trying to enter Grand eruptions. Sorry about the somewhat lengthy turn-around time! Added automated crash reporting so we have more details on future crashes and can hopefully resolve those quicker. Added usage statistics tracking so we can focus on the areas of the app used the most. This is 100% anonymous, yet you can disable this in the settings if you feel uncomfortable with it. We hope you’ll find these new enhancements useful. With 834 installs and 2124 entries the GeyserTimes for iOS app already seems to be a valuable and well-received addition. If you have any feedback, please contact us through one of the established communication channels. We might not always respond, but we are always listening. Also, if you don’t have the app yet you can grab your free copy on the App Store. Happy gazing and best of luck with your favorite geysers! We have now started a Telegram channel! On this channel we plan on releasing notices about updates and status updates as well. A lot of you have been impatiently waiting for this moment and we’re excited to announce that the wait is finally over! The latest beta release of the GeyserTimes for iOS app now includes the ability to login and enter eruptions and notes, almost in time for the start of the new gazing season. We realize that this has taken us longer than expected and apologize for the delay. Important: please keep in mind that, unlike the Android app, you’ll currently need to manually refresh the data before heading out into the basin. If you don’t already have the app, please refer to our last introductory blog post for instructions on installing the GeyserTimes for iOS Beta release. You can now log into your GeyserTimes account by selecting the More tab, tapping the sign in button and then entering your credentials. If you forgot your password you can reset it straight from within the app and if you happen to not have an account you can also sign up for one. Once logged in, a plus icon will appear at the top right of the Day Summary and Predictions tabs. Tapping it will take you to the submit screens where eruptions and notes can be entered. These include full compatibility with all fields currently supported by GeyserTimes, including Grand codes. Submitted entries are stored offline and will be synced with the server once a network connection becomes available. Also, when viewing any eruptions and notes entered by yourself, you‘ll be presented with a pencil icon for editing the entry and a trash icon for deleting the entry. This can be helpful for adding an eruption duration after submitting an entry, for example. Furthermore, we’ve squashed a few bugs that were present in our last beta release. Predictions by GeyserTimes are now correctly displayed and recalculated offline. Another issue where primary and secondary eruptions were not properly connected at times has also been fixed. If you have any issues logging in or entering data, feel free to contact us at webmaster@geysertimes.org and we’d be happy to help. Note that signing into GeyserTimes is only strictly necessary if you want to enter eruptions or notes. All publicly available data can be viewed without an account. As some of you might know, the normal yearly cost for an Apple developer account until recently was $99, regardless of any non-profit status. In a change of heart, however, Apple has decided to waive those fees for non-profit organizations last December and we are currently working with GOSA on acquiring such an account. This is one of the reasons why the app still is a beta release and not available in the normal App Store. Huge thanks to the folks at GOSA for being willing to help! We’re also hopeful to have the next feature release ready sooner. This will primarily focus on getting full support for comments, confirms, flags and attachments ready. In addition to that we’re also expecting to have automatic syncing onboard so you don’t have to worry about keeping your data up-to-date. Also planned is the ability to search for geysers both within the app and via the global Spotlight search. As always though, we cannot give any exact time frame since this largely depends on the amount of time each of us has available for development. Thanks for your continued patience! Last, but not least, we’d like to thank all of you for dutifully entering your data into GeyserTimes. We sincerely hope that the addition of the iOS app will make it easier and more convenient for you to continue to do so in the future. If you have any suggestions or feedback, please don’t hesitate and let us know! We wish you all a fun and joyful 2018 gazing season! 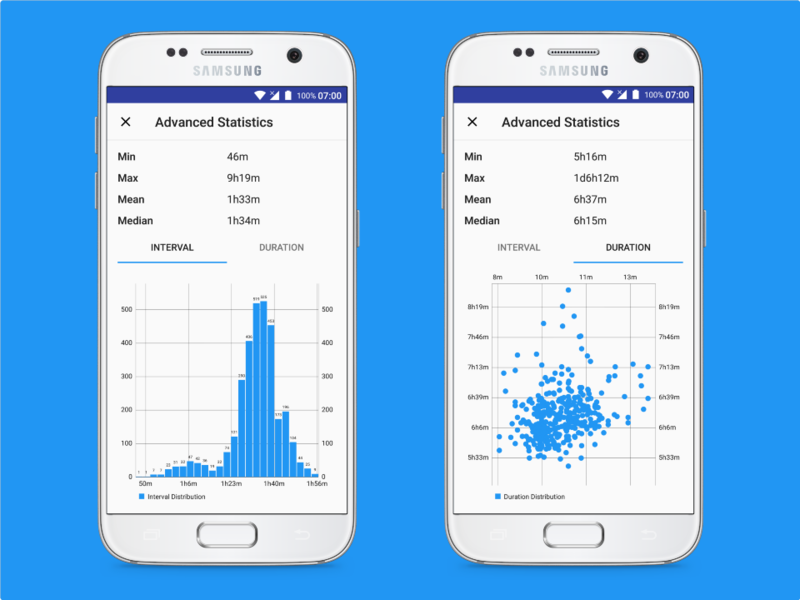 In the past year we’ve primarily worked to improve the stability of the GeyserTimes Android app, migrating to the Realm mobile database which should allow for easier maintenance in the future. However we’ve also managed to add a couple of other enhancements and new features which will be discussed in more detail below. The submit screens have been reorganized to make it easier to enter data. Improvements include direct search for geysers and a new duration timer which should make it easier to submit eruption durations to the database. While we realize you’ll need to get accustomed to the new layout, we believe it is easier to understand and more structured for newcomers who want to contribute data. The new duration timer can be started by pressing the “Start” button. Once the eruption has finished press the “Pause” button to stop the timer, should the eruption continue (I’m looking at you, Grand) you can press the “Start” button again and the stopwatch will continue. Entries with a running timer can be safely submitted without influencing the stopwatch. The GeyserTimes website introduced a new prediction system some time ago that included additional geysers and a more flexible calculation system based on a set of parameters (e.g. add 92 minutes after an Old Faithful long). The Android app has now finally caught up with this development and displays all the predictions using the updated system. Best of all: it also works offline, which is especially helpful for geysers located in the Lower Geyser Basin. Simply enter a new eruption and the prediction will be recalculated. Echinus, here we come! When viewing the recent geyser activity there now is a “More statistics” button below the calculated interval statistics that will take you to the interval and duration charts, allowing you to analyze the recent geyser behavior at a glance. Just like any other statistics you encounter these should be carefully interpreted though — some geysers have incomplete data or don’t erupt often enough to gain much insight. More often than not, this is more of a fun and intriguing chart than a scientific tool. We’ve also improved the overall integration of the app with the Android system. 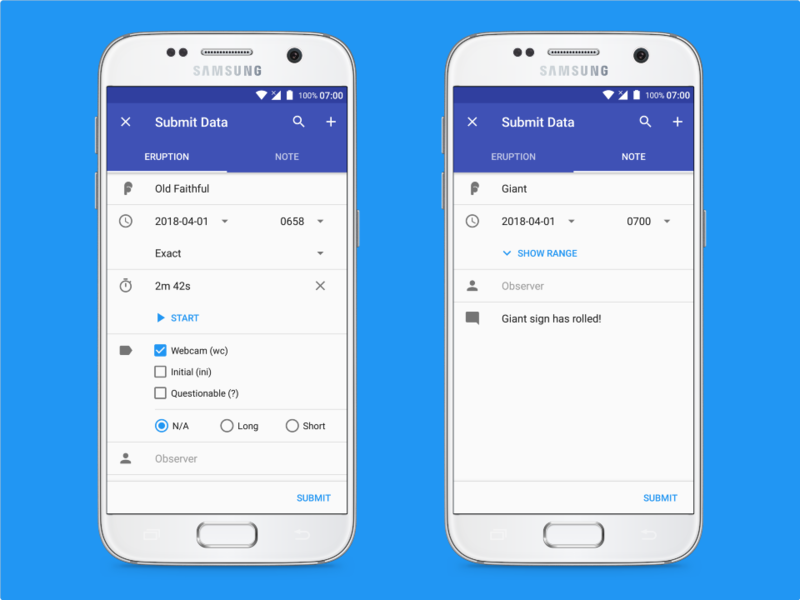 The login, signup and forgot password screens have finally been updated to Material Design, Google’s new design language introduced with Android Lollipop, and web links are now handled by the GeyserTimes app, allowing you to view entries from a web search directly within the app. 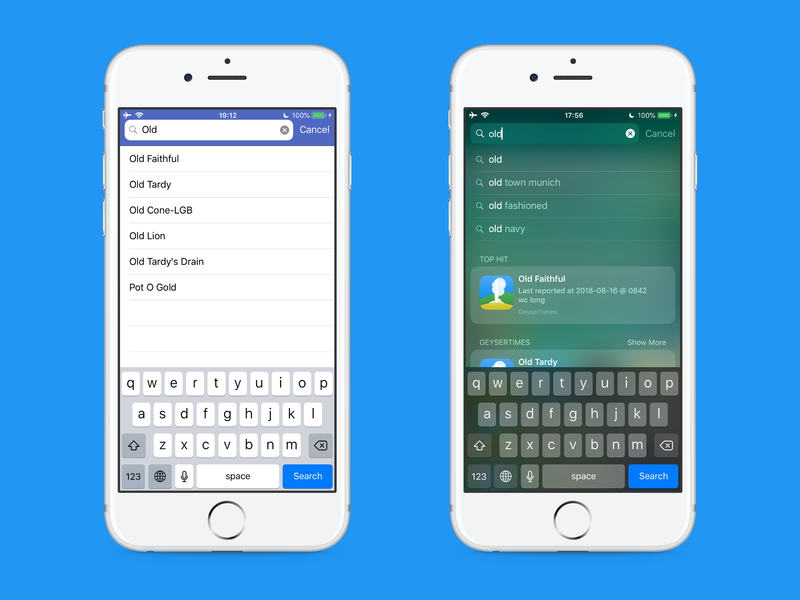 Most information is now also easily shareable with other apps such as Facebook Messenger and WhatsApp. 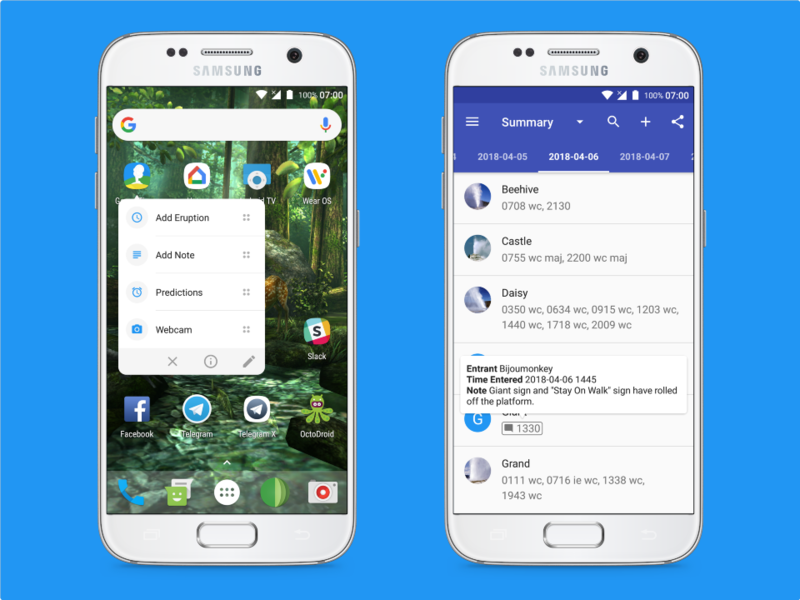 App shortcuts have been introduced to allow quicker access to relevant areas within the app (accessed by long-pressing the launcher icon on Android 7.1 Nougat and above). On compatible devices, such as the Samsung Galaxy S and Note series, you’ll also be seeing popups on eruptions and notes that include additional details by hovering over the entry with your finger or pen. Other notable enhancements include the ability to select more than 10 favorite geysers and to selectively filter unwanted geysers in the day summary and timeline (who wants to see all those Old Faithfuls, right?). You can find these options within the application settings. Your feedback is very important to us, which is why we’ve included a new “Feedback” item in the navigation menu. Don’t hesitate to drop us a few lines and let us know how we’re doing. If you don’t have the app already, download it now on Google Play, it’s free and you won’t regret it. Some of you have already been waiting for this moment for quite a while, and now it has finally arrived. 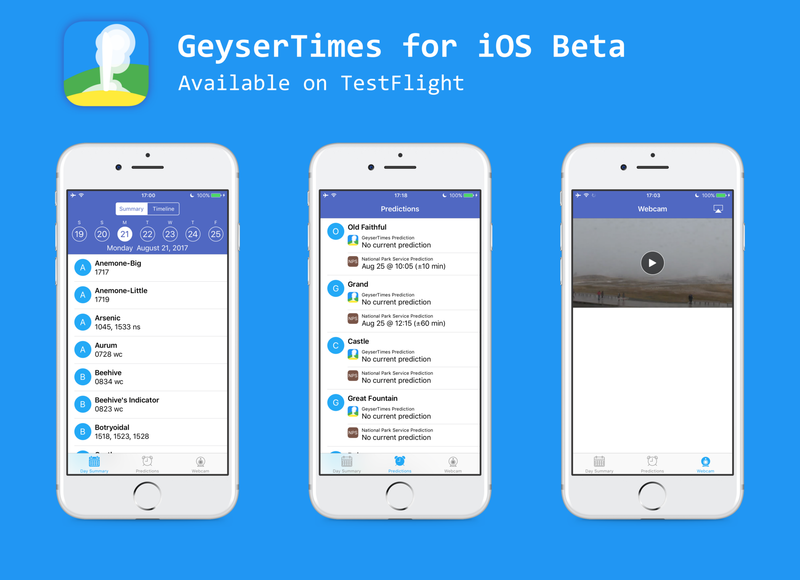 Today we are announcing the first beta version for the GeyserTimes for iOS app that can be installed using TestFlight. If you can’t wait, skip ahead to the section How can I get it?. There are some important limitations currently that you should be aware of and which will be addressed in future updates. Mainly, the ability to login and enter eruptions and notes is missing, but we feel ability to browse GeyserTimes data while offline might already prove useful to some of you. Rest assured that the other features will be added as soon as possible. This post serves as an overview of what has been done and what is planned for the future. Most of the items related to viewing data from GeyserTimes have already been implemented. As with the Android app, everything is available offline so it can be accessed without any internet connection, something indispensable given Yellowstone’s spotty network. 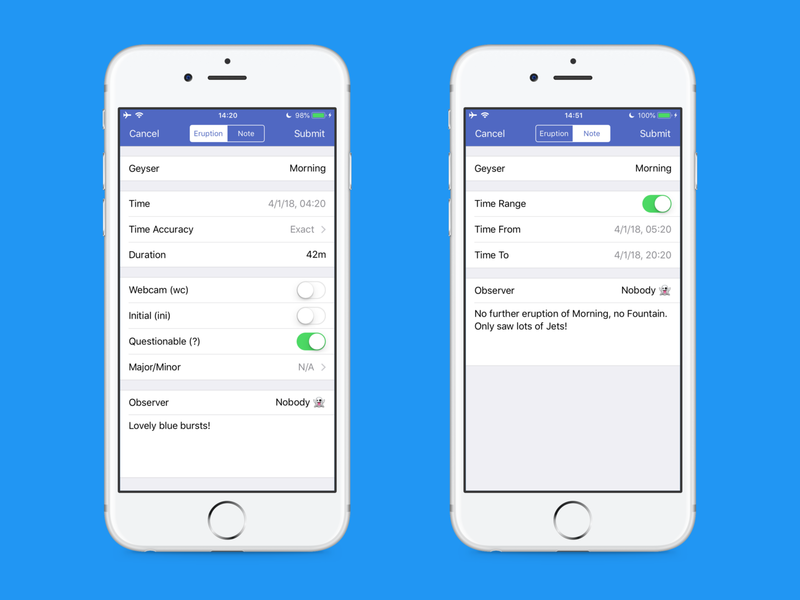 The main screen displayed when starting the app presents the day summary or timeline. You can switch to the current predictions and the Old Faithful streaming webcam using the tabs at the bottom. Tapping on an entry will take you to the details, including any comments, confirms, flags or attachments available for that entry, which will be displayed below the detailed entry information. Tapping on a geyser or user will take you to the appropriate detail page with their recent entries. You should find all information displayed on the website within the app. One notable exception is the lack of statistics (min, max, mean and median intervals) which will be added later. If you require any support using the app feel free to contact us at webmaster@geysertimes.org and we will do our best to help out. Apple has two types of releases, both of which go through the App Store review process. Store releases are reviewed more thoroughly and are available to download from the App Store that most of you know. 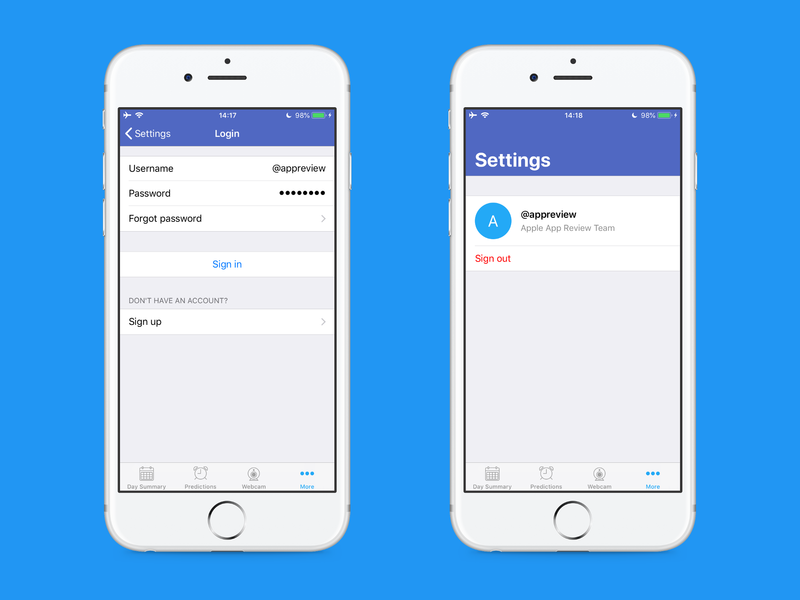 Beta releases are only available for download within the TestFlight app from Apple, which is designed to distribute beta releases as well as ease the feedback process. The GeyserTimes for iOS app will likely go through a couple of Beta releases before it will be made available as an App Store release. The obvious next step will be the implementation of account functions (login and logout) as well as the ability to enter, edit and delete eruptions and notes, after which a new Beta release will be published. After that comments, confirms, flags and attachments will be tackled, probably in a separate Beta release. We will let you know once those are ready in a different blog post. Once all this is done we will make the app ready for a wider release in the App Store. Unfortunately, we can not give a time frame when this is going to happen due to frequent changes in the time available for development. We would like to thank you all for your patience in this matter. The GeyserTimes for iOS app is only available as a Beta version at this time, which is why it can’t be downloaded directly from the App Store. The few extra steps necessary are outlined here. Just follow these step-by-step and you should be good to go. Send an empty mail with the subject “GeyserTimes for iOS Beta” to webmaster@geysertimes.org from the email address you use for your Apple account. 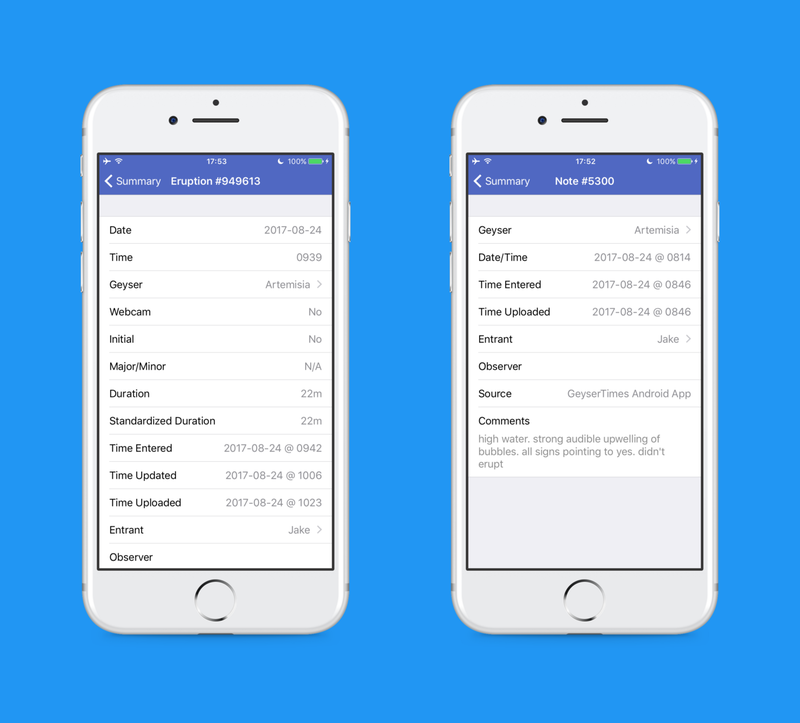 Wait for a mail inviting you to join the beta testers for the GeyserTimes for iOS app. Since we need to manually add all testers this might take a few ays. We will try to process those as fast as we can. Download or open the TestFlight app provided by Apple using the button present in the invitation mail. 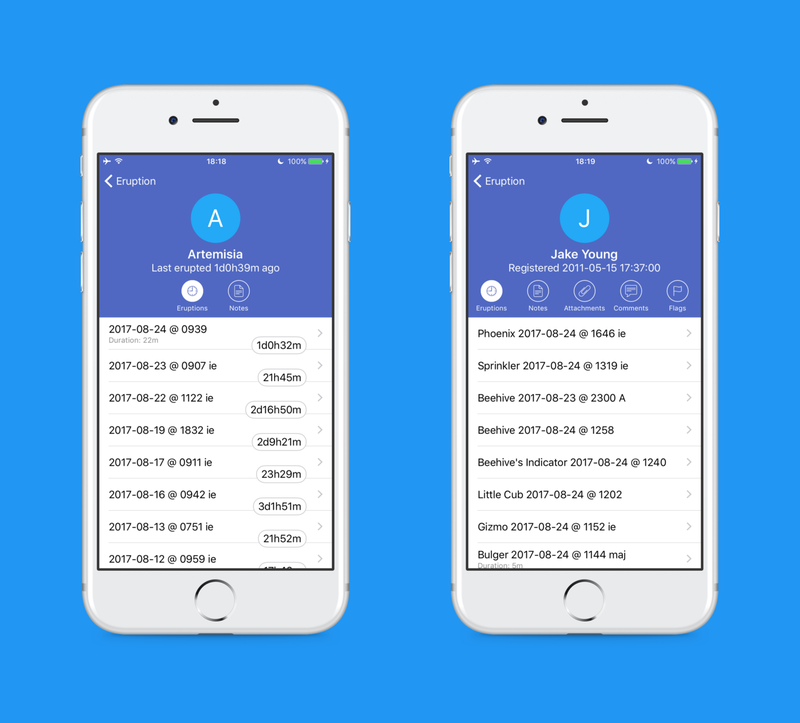 This should guide you through the process of installing the GeyserTimes for iOS app. We hope you enjoy this new addition to the GeyserTimes ecosystem and don’t encounter too many issues. Be aware though that this is beta software, so the occasional bug is expected. Feedback can be provided using the TestFlight app or any of the more established channels for communications. We already look forward to hearing from you! Jake fixed a bug with the app sync code timing out for some requests. Fixes a crash when trying to view the details for an attachment. Released an update that made some improvements to the look and feel of the predictions page.